Holidays in London are always festive and busy. 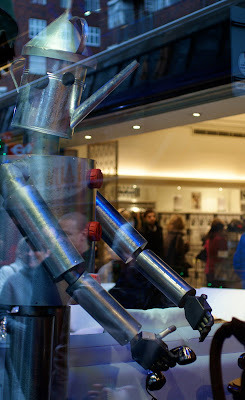 The high street shopping seems to be mainly for the brave, as the stores become elbow to cheek with holiday cheer. 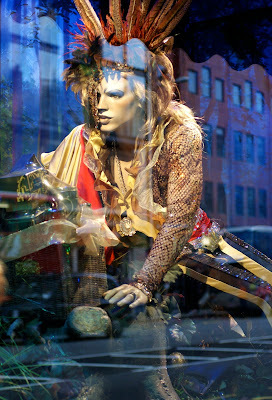 Saturday my friend Robert and I took a walk to Harrods department store for a yearly ritual to see the window displays. They have gotten away from anything religious as the diversity of the city has grown. 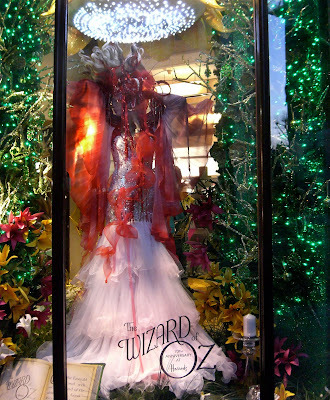 This year Harrods is celebrating the 70th anniversary of the Wizard of Oz. 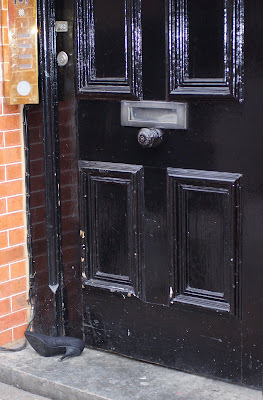 Just a few blocks away from Harrods, I noticed this doorstep and couldn't help but wonder....hmmm....not quite a Ruby Slipper, but there must be a story here. London had a rare snow a few days ago adding a little holiday atmosphere. Wizard of Oz music is pumped out onto the sidewalks and inside the store. 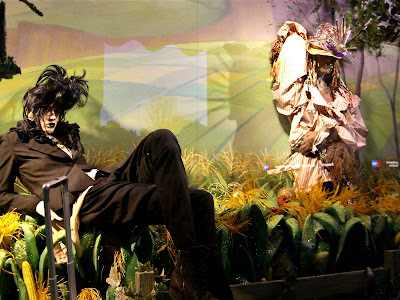 "Somewhere over the rainbow, way up high..." In this rendition, Harrods dropped full force onto the witch. You can only imagine what this young man was thinking. 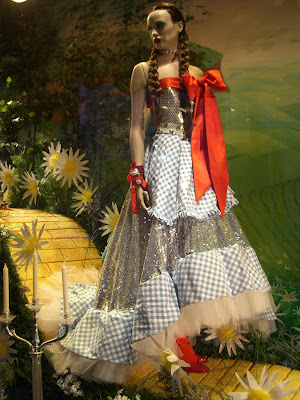 And Dorothy got a little gussied up as well as a few other characters. 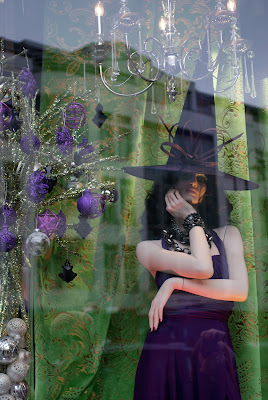 The witch never looked more beautiful, and not wicked at all. 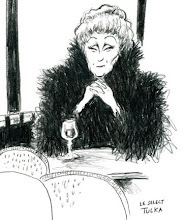 There is just a little drama and opulence in this version. The scarecrow, the tinman, the cowardly lion, and the monkeys all had an extreme makeover. Dorothy, you're not in Kansas anymore! Going inside, the store and mainly the food halls were jammed with shoppers with full wallets. 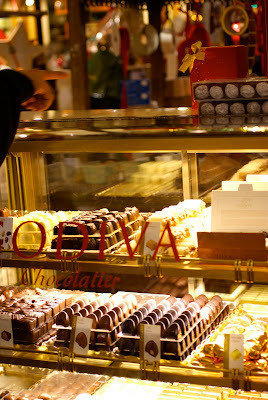 There were many chocolatiers displaying exotic chocolates and goods to sit beside them. And there was no shortage of the ubiquitous Harrods green shopping bags. I managed to get away only with photos and no green bags. The next stop was the Victoria and Albert Museum, which is just down the road. 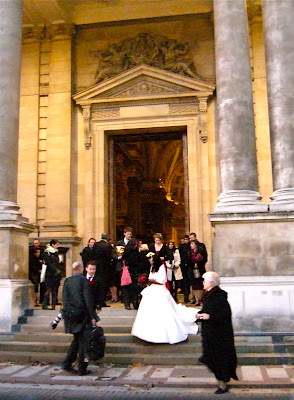 Another magical vision appeared before us as a stunning bride was leaving the Brompton Oratory from what looked like a storybook wedding. Best wishes to them! Later on in the evening as I looked out of my hotel window, the streets of London were lit up like a Christmas tree as the holiday traffic filled the streets. If you look closely, you'll see the Emerald City of Harrods lit up in green ....a slight movement of my camera gave a vision of candy canes Happy Holidays from London! oh how i love traveling with you!!! You show me things I would never see. 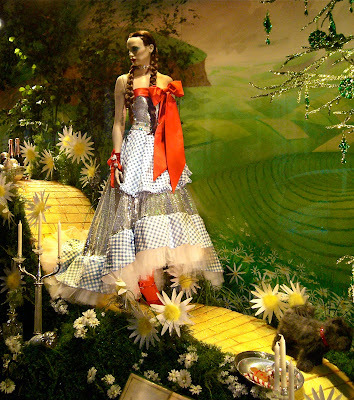 I love Dorothy and The Wizard of Oz..In fact when I started buying my own shoes at my first job..the first pair I bought? Red. Oh Diane, I enjoyed that so much. 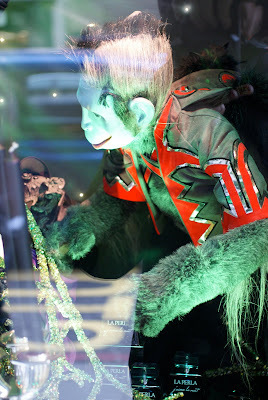 I love London, busy as it is...The window displays are just exquisite this time of year.The colours, lights,just everything! Tq for the lovely trip. Fabulous photos! I hope your new year is filled with more wonderful (and safe) trips for you to share with us. Diane, it is such a DELIGHT to see the world through your lens. 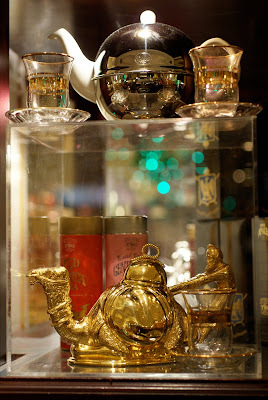 Thank you for this tour of London at Christmastime. 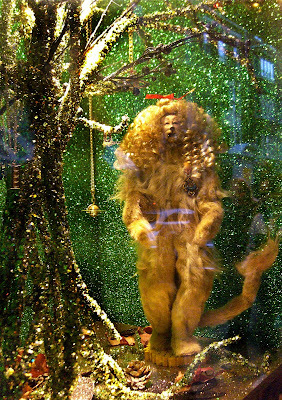 My favorite photo is the witch's feet sticking out from under Harrod's. What a hoot! I can't believe you got away without any green bags. BRAVA! I love the candy cane lights. Thank you for transporting us once again to a magical place! 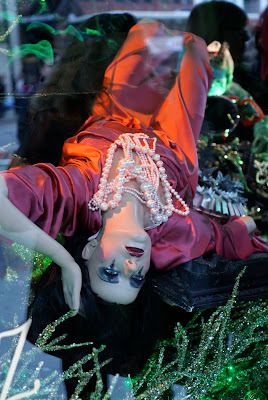 Loved all the window shopping shots but the shoe at the door - now that's an intriguing photo! Merry Christmas and Happy Travels in 2010! Monique...I'm sure those red heels bode you well! We should all have a pair in our closet. Kate, Oh, I've had my share of "those" green bags in the past, I mainly prefer the Food Halls...at least I can rationalize that! Lori...If I posted all of the random things I see on the street that fascinate me, I'd have a whole other blog! As for the black high heel, I prefer the first interpretation. 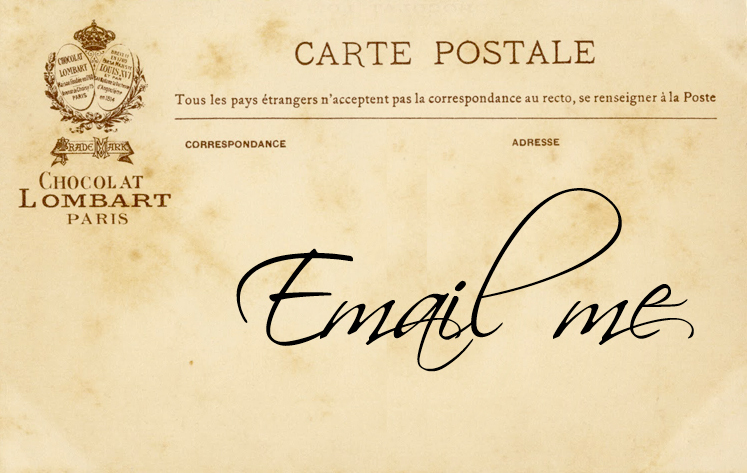 It could be the beginning of a romantic novel! Happy and safe Holidays, everyone.